The Renault Zoe, (left) and Nissan Leaf, right, both EVS, will use connectivity technologies. 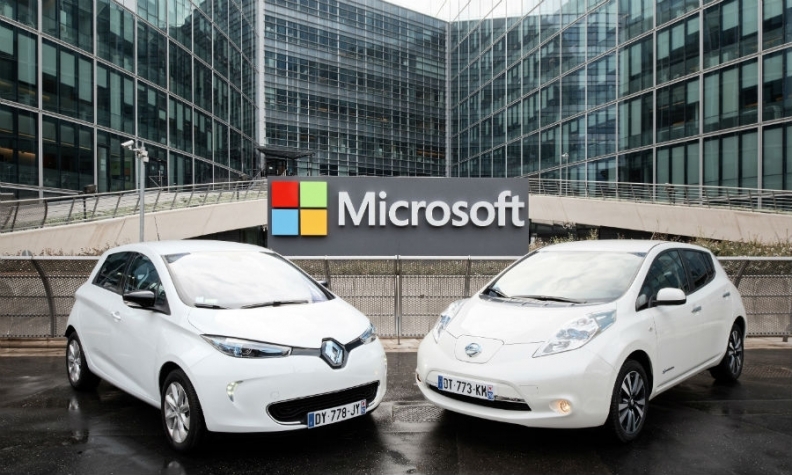 Renault and Nissan said they are partnering with Microsoft to develop cloud-based services for cars, a step toward the automakers' plans to build self-driving automobiles by 2020. The services will be based on Microsoft's Azure cloud service and will include advanced navigation, predictive maintenance and over-the-air software updates. Renault and Nissan plan to launch more than 10 vehicles with autonomous drive technology by 2020. In January, the alliance hired former Nokia executive Ogi Redzic to lead its connected car efforts. The alliance said last week it would buy French software development company Sylpheo to offer new services including ride hailing and car sharing. Automakers from Toyota Motor Corp to General Motors have been investing in software firms and tech start-ups to position themselves for the rise of autonomous driving, ride-sharing and other connected services which threaten the traditional vehicle ownership model that has dominated the past century.